The simple price of a grande latte got Starbucks Corp. in trouble in China. After a week of print reports by China’s state-run media accusing Starbucks of “profiteering,” China Central Television (CCTV) aired a report criticizing the company’s “excessive” profit margin. China Daily had published an article titled “Starbucks can’t justify high prices in China,” and the Economic Information Daily run by Xinhua news agency echoed the report two days later comparing latte prices to those in Hong Kong, London, and Tokyo. A Starbucks grande latte is $4.80 (27 yuan), nearly $1 more in China than in the United States, Shanghai-based consultancy SmithStreet revealed last month. The same latte in London costs about $3.97, $3.26 in Chicago, and $2.39 in Mumbai, which a Starbucks spokesperson attributed to the varying input costs in each market. The company revealed a 32 percent profit margin in the China/Asia-Pacific region in the second quarter of its 2013 fiscal year, the highest compared to any other global market. The higher prices for foreign products are commonly attributed to import tax, but Peking University professor Wu Changqi told CCTV this wasn’t the case. He said other foreign brands had gotten pricier over the last few years as well, and Starbucks is able to charge higher because it has so little competition. “Each Starbucks market is unique and has different operating costs, so it would be inaccurate to draw conclusions about one market based on the prices in a different market,” Starbucks said in a statement. Chinese consumers value the cafes as a social environment to meet and chat, according to the spokesperson. The customers linger longer, so more has been invested into real estate compared to the United States . “The take-away rate is 86 per cent in the US. But in China, most consumers like to sit in stores for hours. Besides coffee, they are enjoying the service, sofas, background music.” Qi Ming, founder of a China coffee training school, Bloom Coffee College, told Innovative Finance Observation. 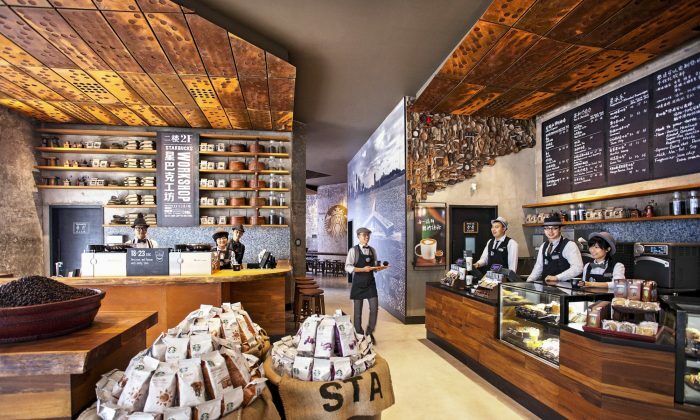 Last month, Starbucks unveiled two new flagship stores in Beijing with a focus on “bold design.” One of the stores features a bar inviting customers to chat with the barista. The other, dubbed Club 1971 after Starbucks’ founding year, centers around a large community table meant for social gatherings, according to a spokesperson. The company previously announced a goal to have 1,500 stores in China by 2015. James Button, a senior manager with SmithStreet, told South China Morning Post Starbucks’ premium was actually lower than other foreign luxury products sold in China. He said he was aware high-profile foreign companies attract more criticism from the authorities in China. “We’ve seen it with Apple, Walmart and Carrefour. It’s a cost of doing business in China,” Button said. Earlier this year, Apple Inc., received similar treatment from the state-run media over its customer service until CEO Tim Cook apologized. Last year, Starbucks raised the price of each drink size by 2 yuan, sparking complaints from social media users. This time, however, the Sunday CCTV report resulted in users across China’s social media sites defending Starbucks, according to South China Morning Post. Financial professor Chak Wong called the report an “odd criticism” misinterpreting Starbucks’ value. Tsinghua University professor Li Daokui said the problem was with China’s economy and not the coffee company. “Why do Starbucks’ competitors lag behind in entering the Chinese market? Do high prices result from hefty enterprise taxation? Are office rents too high? These are the questions that need to be answered?” he wrote on social service Sina Weibo. “Anything CCTV opposes, the general public will support,” another Sina Weibo user wrote.